For my birthday this last year, I had a wonderful friend tell me that she was bringing me a cake. Because it’s not a birthday party unless there is cake. She was so right. I adore her. And the cake she brought? It was magical. 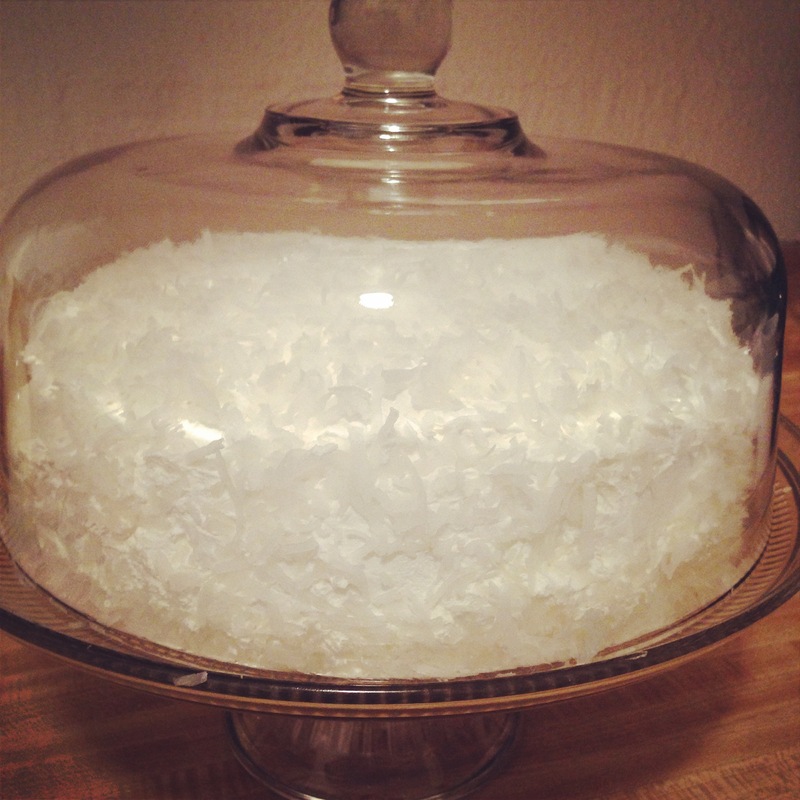 Honestly, I’m not a giant cake person… but I am a giant everything in the world coconut person. And this little magical beauty is covered in coconut. It was perfect and incredible and sweet and marvelous and so heart warmingly coconuty that it filled my birthday with so much happiness and joy. Not to mention, it’s just a very pretty cake. Totally went with my princess themed party (seriously). And when Stevie brought the cake out there was singing and dancing in all of the lands. People rejoiced. I think I sang on a rooftop? Okay okay, you get it, it was a great cake. So when a friend of mine asked some of her friends to bring some desserts to her wedding – this cake came floating back into my mind. It was tasty enough to be acceptable at a wedding, but also pretty enough to belong on a shabby outdoorsy chic dessert table… and it felt like my big chance to test drive this cake! Don’t worry, I realize that test driving a cake at a wedding feels a little risky, but I knew if I failed I could just pick up a cake at Whole Foods and throw it on a platter and no one would be any wiser. Not that I’ve ever done that before… Ahem. So I asked my friend for the recipe and she shared her secret with me – it’s easy to make. Stop it. A cake that tastes like happiness and is so incredibly attractive can not possibly be easy? Wrong friends. It totally can. And I will now share with you how to succeed in making a cake that requires almost no ingredients and will stun your guests (granted, those guests have to like coconut). Thanks to allrecipes for publishing this gem! Mix cream of coconut and sweetened condensed milk together. Pour over the top of the still hot cake. Let cake cool completely then frost with the whipped topping and top with the flaked coconut. Keep cake refrigerated. Now, I switched things up and I made a layered cake. 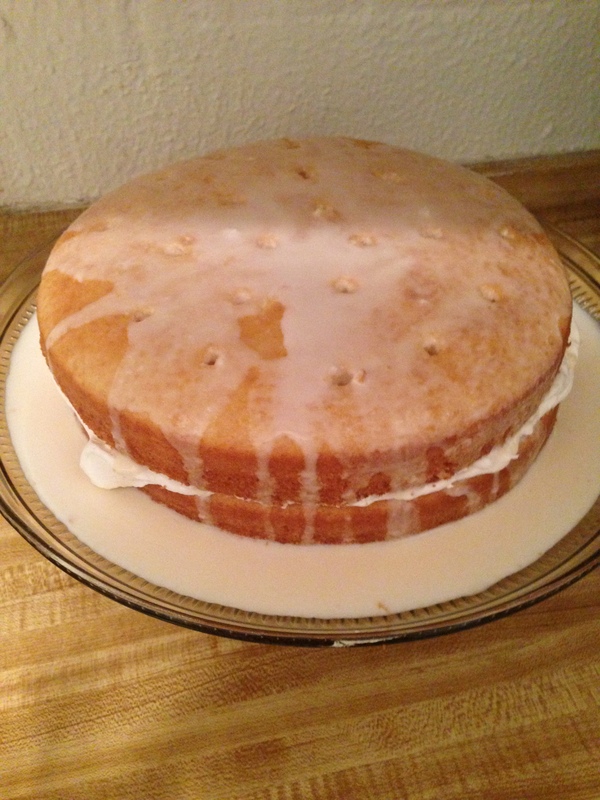 So I let the cakes cool, put one on the cake plate, frosted the middle, poked the holes and then combined the liquids and used about half over the cake (since it didn’t have anything to sit in and soak). It looks weird in this stage, but trust me, totally not weird and 110% delicious. Then I generously frosted it with whipped cream (which, by the by, is fantastically easy and I had a ton leftover) and patted coconut all around the outside. And you guys – it was beautiful. I made it the night before and let it sit overnight (as it was a early wedding Saturday) and I was mildly worried that it would dry out… but luckily there’s so much liquid in this cake I had absolutely nothing to worry about. And for the record, it wasn’t the only thing there that looked good. The cake wasn’t the only thing there winning that day. 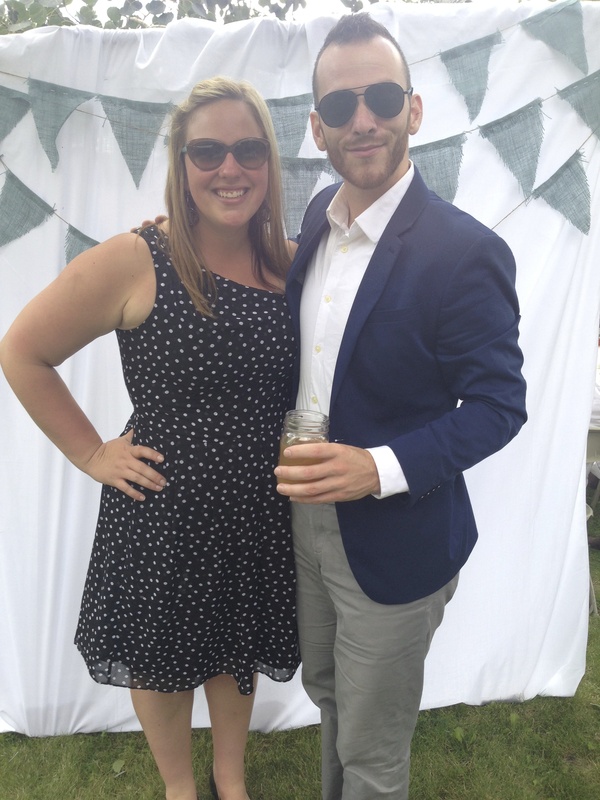 Check out me and my wedding date partner in crime. I have got to start wearing more polka dots. I’m pretty sure if people made more of these cakes, there would be world peace. Start baking and let’s test this out shall we? And if you don’t yet own a cake plate, seriously go buy one. I promise it’ll make everything you do feel so much more fancy.